NEW ORLEANS, LOUISIANA — Each night, Muriel’s restaurant sets a table for Antoine. It’s beneath an ornate chandelier at the foot of a staircase leading to the upstairs bar. The table cloth is white, there’s a candle and a setting for two, with plates, utensils, napkins and glasses for red wine. A waiter will place a basket of French bread in the centre as well as a bottle of wine, usually Cabernet Sauvignon from Napa Valley. This is the way Antoine likes it and there’s nothing unusual about the scene except Antoine has been dead for 198 years. 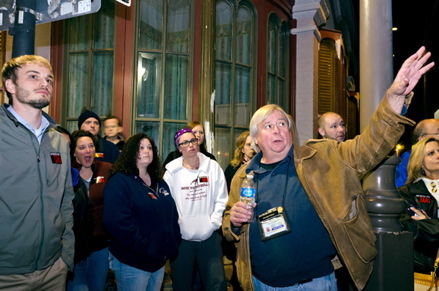 The ghost table at Muriel’s has become a draw for this city’s many paranormal tours. Groups stand outside an iron gate and peer through the window to catch a slight glimpse of the table, which Muriel’s put in place after Hurricane Katrina, in part to help calm the active spirit. With Mardi Gras approaching on Feb. 21, visitors will arrive by the thousands looking for fun, excitement and the bizarre happenings that have brought this city fame. Muriel’s is sure to attract more than a few party-goers looking to scare up a good time. At Muriel’s, that something is by many accounts a wine-loving gambler who loves his home so much he refuses to leave. Pierre Antoine Lepardi Jourdan committed suicide shortly after losing the property at 801 Chartres Street in a poker game, but those who believe he still resides in New Orleans say he hasn’t left the Big Easy or his favourite, um, haunt. Muriel’s is in a mansion that Antoine, during his terrestrial days, restored after a 1788 fire. Denise Gratia, the marketing director at Muriel’s, says diners have asked to be seated at the table with Antoine, but there haven’t been any reports of commotion over dinner. Soon, Muriel’s may be offering “Dinner with the Ghost” as a regular feature, Gratia says. Along with the unexplained glass throwing and the apparent evaporation of wine, other incidents include managers hearing footsteps in the early morning in the locked and otherwise vacant restaurant. Gratia recalls a fire alarm going off at 2 a.m. during Hurricane Katrina. “There was no one in here. When the managers arrived, the alarm was blaring and we don’t know how it could have went off,” she recalls. Not long ago, Dubaz says, there was a report of a woman stumbling away from a table during lunch. She claimed she had been pushed but no one was behind her. When someone checked the sturdiness of her chair, a wallet with $2,000 in it was found beneath the table. A previous guest had lost it and the story goes that Antoine helped to recover the cash. Paranormal investigators have suggested those ghosts are patrons who died during fights when the property was a tavern in the 1800s. Muriel’s, a fine-dining establishment that opened in 2001, isn’t shy about the property’s history. Its website details the ghost stories related to it. 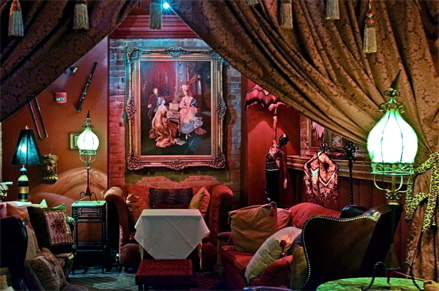 Upstairs, it has a séance lounge that features faux pharaoh’s tombs, red velvet drapes and couches, and a ouija board that can be brought out on request. Ghost or no ghost, Muriel’s is a place that knows how to have fun — like so many other venues and people in New Orleans. It’s no wonder someone might want to stay here for eternity. What a fabulous story. I’m filing this one for the next time I return to New Orleans. RESPONSE: Thanks, Bobby. Let me know when you’re in New Orleans; we’re planning to go back! RESPONSE: Thanks, Bret! NOLA is always a blast! Muriel’s is one of my favorite restaurants in NOLA. Great story! RESPONSE: Thanks, Tesha. Glad you liked it! While sitting at the bar in Muriel’s, I felt what I can only describe as a hand caressing the back of my bare calf. I checked the very sturdy bar stool for loose trim or fabric, looked for passageways that might produce a strong draft, or a staff member who might have passed by – nothing! We’d been informed by our guide that Antoine liked to stroke ladies’ hair. I guess I appeared amenable to liberties of a more personal nature! Cheeky ghost! RESPONSE: Great story — but are you sure it wasn’t the effect of one too many of Muriel’s Hurricanes?